OSIRIS-REx is a mission to visit asteroid Bennu, pluck a sample from its surface, and bring it back to Earth. It is a journey across the vast emptiness of space, spanning over seven years. The journey will be made by a spacecraft travelling at enormous speeds across the Solar System, capable of performing precision maneuvers that result in gentle contact with the asteroid surface, and culminating in the safe landing of a sample return capsule in the Utah desert. How does Bennu orbit the Sun? Bennu is on an Earth-crossing orbit that circles the Sun every 1.2 years with an orbital velocity over 28 km/s (almost 63,000 miles per hour – mph). Bennu approaches the Earth every six years. At the time of its discovery in 1999 Bennu came within 2.2 million kilometers (1.4 million miles) of the Earth (~5.7 times the average distance to the Moon). The closest approach that we can predict occurs in 2135 when Bennu will fly 300,000 km (186,000 miles) over the surface of the Earth, well inside the orbit of the Moon. Bennu also gets very far away from the Earth. 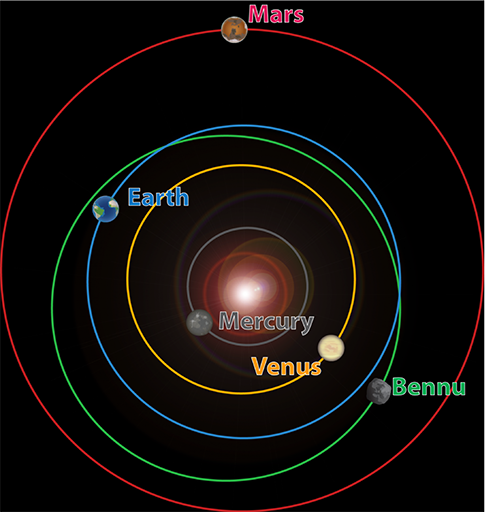 In a single orbit Bennu travels over a billion kilometers (more than 620 million miles) around the Sun. At its furthest point it is over 340 million kilometers (211 million miles) away from the Earth. When OSIRIS-REx is at Bennu it will take over 18 minutes for a signal transmitted from the Earth to reach the spacecraft (and another 18 minutes for the spacecraft signal to be transmitted back to Earth). How will we get to Bennu? In order to rendezvous with Bennu, OSIRIS-REx will leave the surface of the Earth on an Atlas V rocket in the 411 configuration. The Atlas V rocket uses a Russian-built RD-180 engine burning kerosene and liquid oxygen to power its first stage and an American-built RL10 engine burning liquid hydrogen and liquid oxygen to power its Centaur upper stage. The 411 configuration adds a single strap-on solid booster rocket to the first stage. The Atlas V rocket will launch OSIRIS-REx with a hyperbolic escape velocity of 5.4 km/s (over 12,000 mph). Once in space, OSIRIS-REx will perform a series of Deep Space Maneuvers, changing velocity by another 0.52 km/s (1,163 mph). These maneuvers, combined with an Earth-gravity assist one year after launch, will send OSIRIS-REx on a trajectory to rendezvous with Bennu. Asteroid rendezvous requires not only being in the same place at the same time but also moving at the same speed and in the same direction. OSIRIS-REx will perform a series of braking maneuvers, slowing down by 0.53 km/s (1,186 mph), resulting in a relative approach velocity of 20 cm/s (~0.45 mph). OSIRIS-REx is basically formation flying with Bennu during the asteroid encounter. The total change in velocity is just over 20 cm/s (0.45 mph), miniscule compared to the large maneuvers required to arrive and depart from the asteroid vicinity. The encounter culminates in the touch-and-go maneuver when OSIRIS-REx contacts the surface of Bennu for a total of five seconds, at a velocity of 10 cm/s (0.22 mph), and collects the sample. How will we get home? The window for departing Bennu opens in March 2021. At this time OSIRIS-REx will fire the main engines and leave Bennu with a speed of 0.32 km/s (716 mph). This burn will place OSIRIS-REx on a ballistic trajectory that intersects the orbit of the Earth in September 2023. Four hours before atmospheric entry OSIRIS-REx will jettison the sample return capsule then perform a deflection maneuver of 17.5 m/s (39 mph) that places the spacecraft on a stable orbit around the Sun. The sample return capsule will hit the top of the atmosphere with a speed of 12.4 km/s (27,738 mph). The heat shield removes over 99% of the initial kinetic energy. After entry the SRC will free-fall until it reaches an altitude of ~3 km (1.9 miles), at which point the parachute will deploy, bringing the capsule in for a soft landing in the Utah desert, seven years after launching on the journey to Bennu and back.